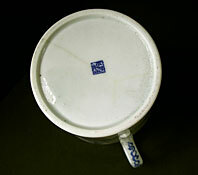 "An attractive blue and white Masons transfer printed porcelain coffee can made by the G.M and C.J. Mason partnership between 1813 and 1825. The shape of the can is charming with slightly flared bucket shape and an unusual and distinctive inner spur to the handle. 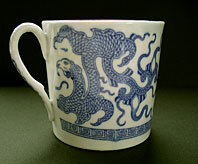 The print to is a real beauty and commonly referred to as the Dragon pattern. The stylized mythical Chinese creature is repeated tree times to great decorative effect across the face of the coffee can. 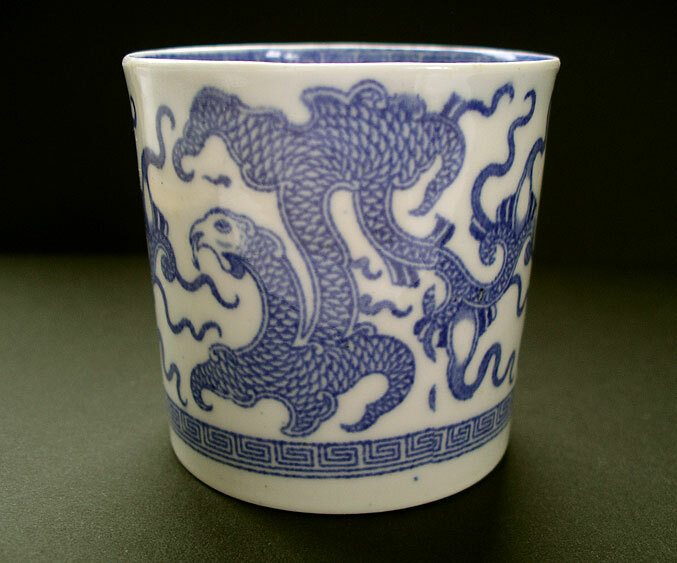 It looks closer to a large serpent so perhaps Chinese Serpent would be a better name... A great piece for the best blue and white and English porcelain collection and one rarely found." Antiques Expert Hamilton Bear. 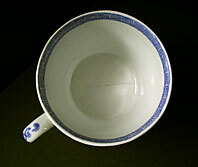 References: Blue and White Transfer Ware 1780-1840, A.W. Coysh, plate 58 page 47 illustrates a G.M. 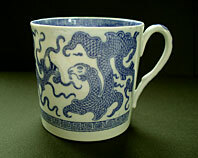 and C. J. Mason plate with a similar Chinese Dragon pattern. Condition: In very good general display condition. There is just a tight fine forked hairline star crack which extends across the base and part way up one side whee it is difficult to spot. The piece is stable and robust and looks good.